We all face back pain almost every day of our lives and everyone could use the services of a good masseuse. However, not everyone can do that and getting the best massage cushion you can find is a good alternative. Massage cushions are designed to help you with your back problems whether it be during long drives, at work or at home. They’re cheaper than going to a massage or getting a massage chair and you can use them wherever you like – a truly amazing piece of kit. However, only some of them are useful, while others are gimmicky and do much for you. Sifting through all of the product available on the market can be quite frustrating since you’ll feel like you’re wasting your time. Luckily, I’m here to do the work for you – I’ve checked out all the best massage cushions, read all the specs and user reviews and seen how the products themselves perform. In this article, you’ll find my guide to finding the best massage cushions and you’ll be able to read my detailed reviews for each of the top products I chose. Here’s a short video on massage cushion for you! Not a good fit for taller people. Great for both taller and shorter people. The rollers wear out quickly. Offers a lot of great massage modes, including one of the best pinpoint massages. It’s a bit too strong and not energy efficient at all. Incredibly easy to use for anyone. Too intense for some and can’t offer a full back massage. Easy to use and features six massage heads. Can’t be used in your car and sometimes shuts off unexpectedly. A wide variety of modes and uses suitable for almost anyone. Doesn’t come with a car adapter and shuts off too quickly. Best Tips That Will Help You Choose The Best Massage Cushion! With so many options to choose from, how do you even find the right massage cushion for you? For starters, you need to know exactly what you’re looking for. Here’s a comprehensive list of questions which you should ask yourself when you’re looking for the right massage cushion. Would you opt for vibrating motors, massage balls or both? Exactly where are you planning to use this massage cushion; in your car or at home? How vital is heat to you? Do you want the cushion to be adjustable, or will you be satisfied with the preset programs? Exactly what intensity level are you interested in? What amount of pressure do you need? How many reviews does it have online? What do the customers say about it? A large number of positive user reviews is always a good sign. Does the product look like it will be dependable? Are the little extras such as air massage or magnets functions important to you? Finally, does the provider take liability for faults in their products? Do they offer a warranty? Is it hassle-free to return your product in case it doesn’t work or you’re not completely satisfied? – You Might Want To Know: What Suitable Time You Should Use Your Massager? 6 Best Massage Cushions Review! 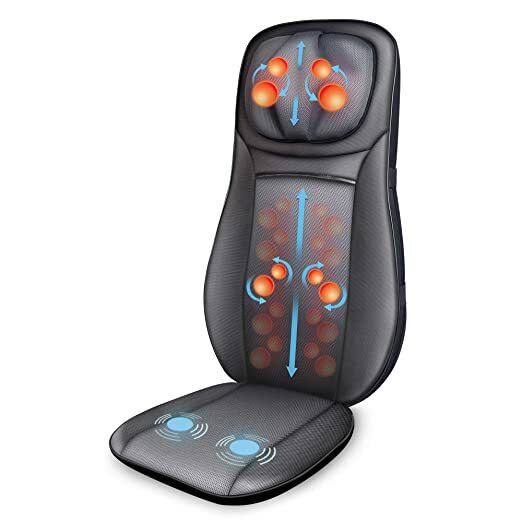 This Zyllion massager easily ranks on the top of my list of back massagers due to its state-of-the-art features, including three different massage styles. It has 4 shiatsu massage nodes which offer an incredibly penetrating massage that alleviates stress and works wonders for back pain. Additionally, you can set the massager to work on a specific part of your body, allowing you to get a full upper body massage or a lower body massage. You can also set the massage nodes to mow up and down your back, relieving the tension around your spine. This massager is easy to use anywhere – it fits well on office chairs, car seats, sofas, recliners and more. It’s the perfect way to get an expert-level massage without ever leaving the comfort of your home. Noisier compared to similar products. The back massage nods won’t align properly for tall people. Verdict: This product is literally the best one if you need a back massager. Its many excellent features are designed to give you an experience akin to a real hand massage. This is the best shiatsu massage cushion for soothing your neck and back pain. Snailax produces a lot of different massage seats, so it’s no wonder that they got pretty good at making them. This unique massager seat includes an extremely comfortable 1.6-inch thick seat. It’s also well-suited for tall people due to its large size – 26 by 16 inches in total. It also has a heater option in the back, but it’s not available for the seat, so your thighs will stay cold. This Snailax massage chair can be used almost anywhere – in the car, in your home or in the office. It features a total of four massage nodes that move up and down the seat to massage your entire back. It also has 4 shiatsu nodes with two different intensities available for its shiatsu massage mode. The chair has a built-in feature that shuts it down automatically after 15 minutes, so you’ll never in danger of wasting energy if you accidentally leave it on. Since the rollers are less durable than most others, this will prevent you from wearing them out this way. While it is great, you should avoid using it for more than 15 minutes at a time since the massage it offers is quite intense. 3D and 2D massaging style. Flexible massage heads and roller. Rollers possess a durability problem. Verdict: If you’re looking for a vibration-based massage cushion with a lot of versatile massage modes in combination with heat therapy, then you’re going to love this product. This is another excellent back massager from Snailax. However, it is a bit different than most of their other products. Most of their massagers focused on rotational-type massages, but this one uses 2 massage heads to give you a pinpoint spot massage. When you choose the 3D massage mode, 2 massage heads are going to go in & out alternatively. While, in the 2D massaging mode, they move at the same time. Honestly, it is just a trick to offer you a feeling of a focused massage. This massage cushion is also equipped with a shiatsu roller that goes across your entire back, simulating the feeling of a shiatsu massage. It comes with two adjustable levels of intensity. They are also equipped with infrared heaters that deliver heat therapy across your entire back, neck, shoulders and lumbar area. 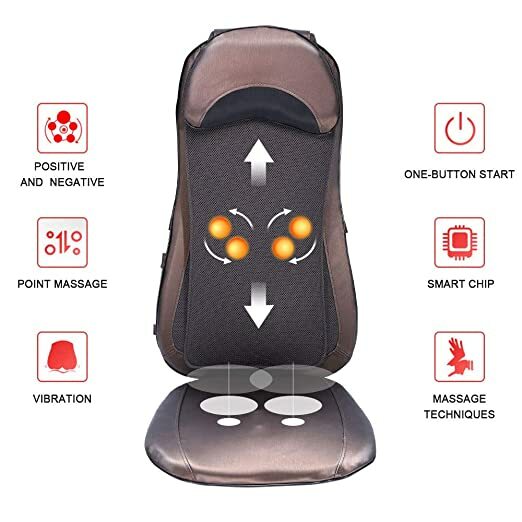 Furthermore, this massage cushion has 3 customizable massage modes focusing on different zones – lower back, upper back, and full back. Trust me they’re truly fulfilling. It’s so intense that it can cause bruising. It’s not power efficient at all. Verdict: This Snailax back massager is a top-notch product. Its 3D massage mode and 2 massage heads are exactly what you need to get a perfect back and neck massage. This Snailax back massager is thoroughly focused on giving you the best shiatsu massage experience you can find. 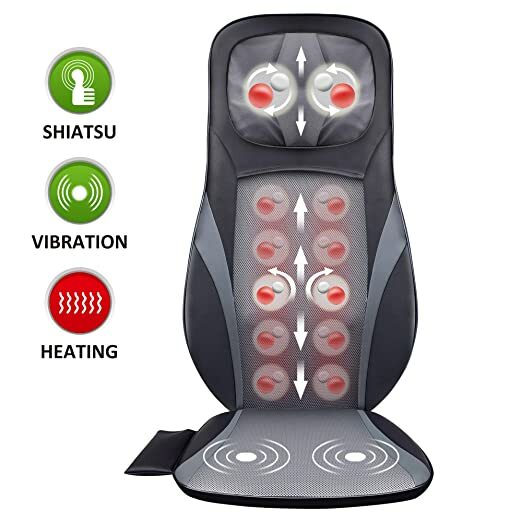 It features 4 shiatsu massage nodes as opposed to the standard 2. 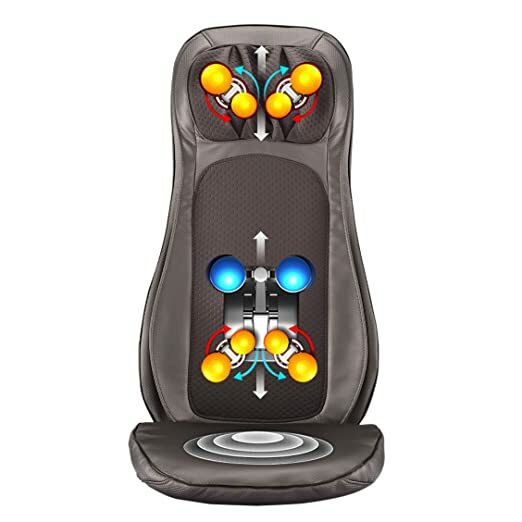 It also features 3 different massage zones – upper, lower and full back. You can also choose between two different levels of intensity and use it for spot massaging. The shiatsu massage nodes also have a heat therapy option, allowing you to easily relieve your sore, tense muscles while improving blood circulation at the same time. This feature can be turned off if it bothers you. In addition to that, this massager also features 4 neck massage nodes that are also adjustable and feature a heat therapy option as well. The width of the back massage nodes is also adjustable allowing you to massage your hips and thighs as well as your back. Despite the high amount of power and versatility that this massage cushion has, it’s surprising energy efficient and you won’t find that your power bill drastically goes up if you’re constantly using it. Doesn’t spend a lot of power. It’s perfect as a gift. Simple and calming heat therapy. It may be too intense. Can’t provide a complete body massage. Verdict: This is one of the best massage cushions to use in the car or in the office. It has a built-in strapping system that will safely fasten to it to almost any type of chair, allowing you to truly relax. This Ronlan massage cushion is incredibly versatile and more adjustable than most other products on the market. You can massage your entire back, just your neck, your shoulders or any other place you like. The rollers are position to massage your entire back from several different angles, allowing for the most thorough massage possible. One of the other great features it has is the vibration massage mode – it’s one of the best around when it comes to this style of massage. It comes with three different intensity options, so you can adjust it to your liking. However, it also has a few other modes. This includes a rolling massage that goes all the way up and down your back while the massage nodes spin at the same time. There’s also a heat massage feature with adjustable temperatures that can cover your entire back. You can also lock the rollers in place for a pinpoint massage on a particularly sore spot. Detachable and machine washable pillowcase. Negative and positive direction massage. Not recommended for use in the car. The automatic shutdown feature sometimes malfunctions. Verdict: This neck & back massager from Ronlan Shiatsu is just amazing. Its vibrational massage is second to none and if you like that, it will be the ideal product for you. This ROTAI shiatsu massage cushion is highly adjustable, probably more so than any other shiatsu massager. It has 5 different shiatsu massage modes with a heat therapy option included. It’s easily adjustable and works for most people, even taller ones. There are massage modes for both the neck, back and lumbar area, as well the hips and shoulders. 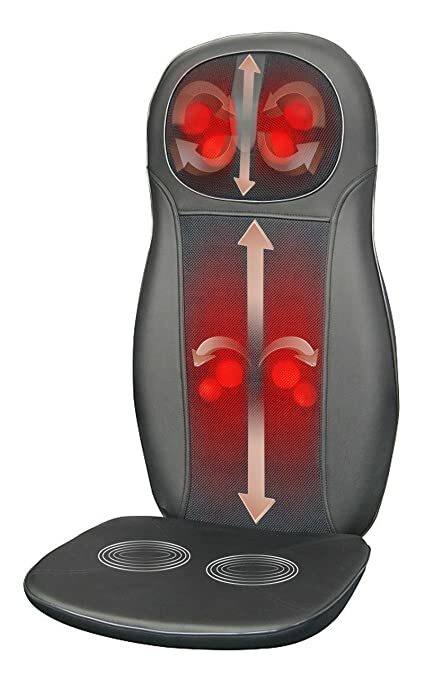 You get the full massage experience and you can even set the massager to focus on specific spots allowing you to relieve the exact area that’s causing you the most pain. It’s also easy to use – the settings are intuitive and it has a one-button start feature. The backstrap on the cushion making it easy to attach to any type of sofa, recliner, office chair or anything else. Sadly, it doesn’t include a car charger so using it in the car is not an option. Still, it’s a highly customizable shiatsu-style massage cushion that will keep your back nice and relaxed. It isn’t too strong or too weak and it doesn’t spend a lot of power either, so it’s perfect for most people. Heating function calms aching muscles. The vibration massage has 3 intensity levels. Easy to fold up and store. Auto shut down time of approximately 22 minutes. Doesn’t come with a car charger. Verdict: This cushion is suitable for a wide variety of people and it shows – there are many great experiences from people who’ve used it. It does have a few limitations, but the shiatsu massage it offers is top-notch. Pro Tips For Using A Massage Cushion! When you’re done and you picked the best massage cushion that you can find, you still have to learn how to use it properly to get the most out of it and ensure that it will remain with you for a long time. Here are a few tips on using your massage cushion the right way. Don’t cover heated massagers with cloths or plastic bags. Doing this could cause the massager to overheat and short-circuit or even catch fire. Make sure you read the manual thoroughly to ensure your safety. Leaving the massager plugged in when you’re not using it is quite risky. It will spend a lot of power, at the least, but it can also short-circuit or catch on fire. Leaving it turned on in your car will quickly drain your battery. Check the voltage before using your massage cushion and make sure it fits your power outlets. If there’s a mismatch, you might have a fire hazard on your hands. Compression massagers should not be used by diabetics since it can negatively affect their blood vessels. Pregnant women should never use a massage cushion without consulting with their doctor first. People with pacemakers or metal implants in their body should avoid massage cushions since it can lead to some nasty and dangerous interactions. If you’ve recently had a surgery or you have problems with blood clotting you should definitely consult with your doctor before using a massage cushion. Intense massages can cause problems with your blood vessels or rip open delicate stitches. If a massage cushion seems too big for you, you might want to try these lumbar back support cushions. 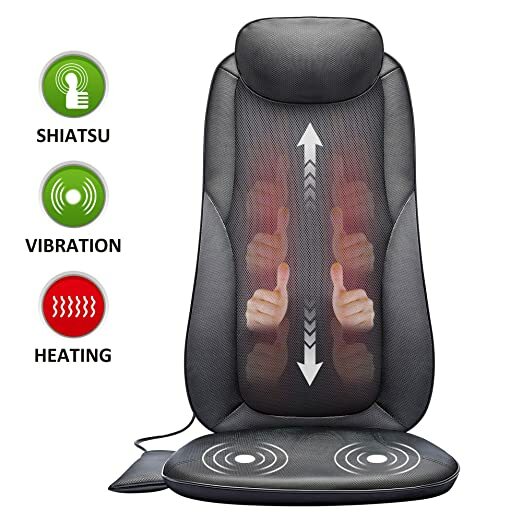 They are some of the best car massage seats available. You Might Like: More Tips to Use a Massager in a Durable Way. There are a lot of different products out there and I certainly can’t choose the right one for you – only you can do that. But, I can give you some good suggestions and you can go from there – I hope I managed to do that with this article. For me, it was quite difficult to choose the winner since I liked quite a few of these massagers but the best one has to be the Zyllion Shiatsu ZMA14 Neck and Back Massager Cushion. It’s equipped with everything you need in a massage cushion and it’s simply perfect for almost any type of back massage. Trying it out is also risk-free since you can get your money back within 90 days of buying it, no questions asked! Another product you ought to consider is my close second, the SNAILAX Shiatsu Neck and Back Massager. Its thick cushion is extremely comfortable and well-suited for longer massages. The heat therapy option is great for soothing painful back muscles and it has an automatic shutdown option so it never wastes any power. I recommend you give this one a shot as well. Keep everything I said in mind and you won’t go wrong – you don’t need to pick one of the products I consider to be the best, pick for yourself. Thanks a lot for getting to the end and reading all I had to say. I hope you liked the products I recommended and that you’ve found what you’re looking for. Never hesitate to try a few different products out if you can afford to – that’s the best way to find the perfect one for you. If you liked this article, feel free to share it around with others who might like it. If you have any questions, feel free to post them below and I’ll get to them as soon as possible. Or just share your thoughts, I’d love to hear from you. I hope to see you again next time and, until then, stay well! – Recommended Reading: The 7 Best Portable Massage Chairs of 2018: Delivering Comfort, Quality, and Relaxation.